The internet’s obsession with barn finds is certainly uncanny. Almost on a weekly basis, a motoring enthusiast uncovers a rarity which has been abandoned for quite some time. Sometimes the vehicles include elderly and collectable Volkswagen vans, classic American muscle, or low mileage day-to-day commuters from days gone-by. However, occasional super car exotica is also unearthed and paraded virally. Often, daily run-arounds from bygone eras attract the most attention. British motoring enthusiasts will be certain to go wild over the discovery of Mk1 Ford Escorts or Mk1 Volkswagen Golf GTIs. Similarly, such attention needs to be brought to this oddity from Volvo. Gone are the days when school boys bully peers whose parents ferry them around in Volvos. Indeed, elderly Volvos have enjoyed somewhat of a resurgence amongst classic car types. Aforementioned Volvo lovers will surely be excited to discover a near mint condition 1987 Volvo 340 available right now. Despite the obvious retro appeal, the main selling point is the little Volvo’s mileage – an astounding 132 miles. Fear not, for this time warp 340 has not been a victim of clocking, as sceptics would suspect. Simply put, the elderly owner purchased the vehicle brand new in 1987 from Lancaster Volvo. In a state of senile incompetence, the owner collided with a bollard in a garden centre car park, after only a few weeks of ownership. With a driver’s side wing bearing the battle scars, and a boot presumably full of compost and geraniums, the poorly Volvo was placed into a permanent state of self-reflection whilst the frightened owner vowed never to drive again. 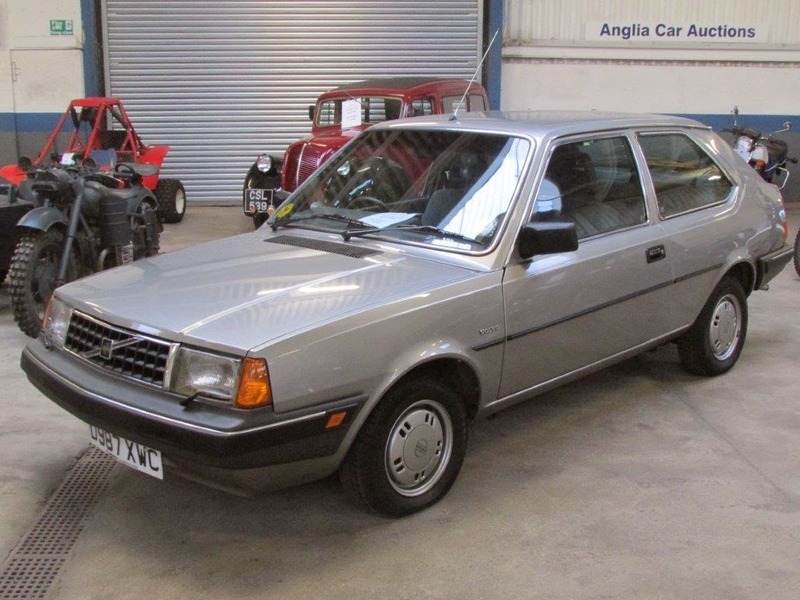 In March though, the abandoned Volvo was relieved from its state of solitary confinement and placed on an auction list for Anglia Car Auctions, where it will be rescued by a new owner on 5th April. Besides the damage to the driver’s side wing, the relative condition of the vehicle is billed to be astounding. The Volvo 340 stills runs, despite twenty-seven years of continuous hibernation, and even maintains the unmistakable aroma of new car smell. Obvious perishable parts, such as brakes, will require attention to pass an MOT test. A change of coolant and oil is also advisable, as this 340 maintains the original issued with the car new. Oddly for the British climate, the car apparently shows no obvious signs of corrosion either, making this unloved Volvo an ideal purchase for the avid enthusiast. The Volvo 340 was the result of collaboration with the Dutch car and truck maker, DAF. Once Volvo had acquired a major stake in the brand in 1973, the 300 series was born. Odd compared to its contemporary competition due to its rear-wheel-drive layout, the 300 series quickly became the budget drifter’s weapon of choice, and hence mint condition examples are now thin on the ground. The gearbox was also mounted over the rear axle to improve the weight distribution, which proved extremely useful in the context of motorsport. Reliability and safety were typical for Volvo, ahead of the competition at the time. However the sheer weight of the little 340 inspired little enthusiasm for the driving experience with standard units. The standard unit available on this particular example is the 1.7-litre petrol unit sourced from Renault. The F-Series unit from Renault produced a modest 81bhp, which never exactly set the world on fire, but proved a popular all-rounder amongst buyers. With the auction underway on 5th April, Volvo enthusiasts will need to get their skates on to have a chance at owning a twenty-seven year old Volvo with fewer miles than today’s dealership demonstrators. More details can be found here for now. Happy bidding!